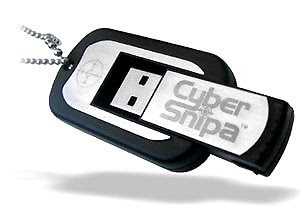 This novelty item combines a USB pendrive with a flashlight and a multi-tool in the shape of a dogtag chain. The tool comes shaped as a dogtag with a chain, intended for neck carry but can certainly be used in a keychain with a shorter chain or a splitring. The USB drive has 512MB of capacity and slides in and out from the tag. It has a normal transfer rate, nothing exceptional but is not bad either. From the "case" sides 3 small tools can be opened, a small set of pliers, a flat screwdriver and a bottle opener. The small tools are fine, a little fragile but they are not intended as power tools. The flashlight is activated pushing a button, it is not very bright but works if you need a light in a hurry and have this handy. You can read more and order for $54 from this site.